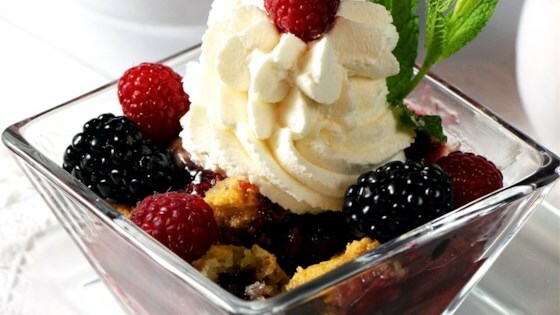 "This is a wonderful berry crisp. I use a triple berry mixture of raspberries, blackberries, and blueberries, but just one works well too! My family loves it! Serve it with whipped cream and it looks great." This crisp features an explosion of summery berry flavors. You'll love it. very easy to make and very yummy! use 2 cups of each fruit that your using and only 1 cup of butter, that would be my only suggestions! My husband LOVED it!! Thanks!